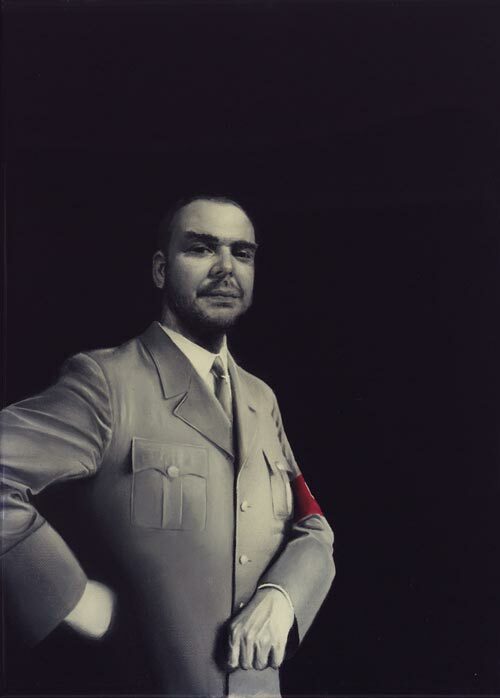 Sam Leach is aware that his self-portrait in Nazi uniform could be controversial, but he has painted the provocative image with a seriously considered message in mind. Leach is known for his exquisitely rendered paintings that reference the techniques and motifs of 17th Dutch painting. He frequently paints animals, often dead, in the style of a Dutch still-life. Very often, the work is small with quite labour-intensive detailing to encourage an intimate and individual encounter with the portrait. The whole painting is coated in resin, which forms a reflective barrier. This seals the painting in so that it is isolated from the world around it. At the same time, the reflection draws the viewer further into the pictorial space. Born in Adelaide in 1973 and based in Melbourne, Leach has a Bachelor of Arts, Honours (Painting) from RMIT University, where he is currently undertaking a Master of Arts (Fine Arts). Last year he won the Siemens Art Prize Scholarship and Acquisitive Award, and the Eutick Memorial Still Life Award. In 2006 he won the Metro5 Art Award and the Geelong Contemporary Art Prize. He was named one of Australia’s 50 most collectable artists in Art Collector in 2007 and 2008. He was a finalist in last year’s Archibald Prize with a portrait of Jeff Kennett and bird.